Vanessa Hayes and Wiremu Kerekere (grand-uncle) swapped shares in whanau land at Torere for a home in Gisborne in 1981. Vanessa then incorporated Torere Macadamias Ltd (TML) in 1999 to lease and mortgage the block for macadamia development. Variety trial plantings began in 1996 and a quarantine facility and nursery was built in 2001 to import, trial, propagate and assess the best varieties suitable for New Zealand conditions. TML is owned 50/50 by Vanessa Hayes (owner, Life Broker Services Ltd) and partner Rod Husband (Sales Manager, Gisborne Motors Ford) and run totally by Vanessa, Rod and whanau in Torere and Gisborne. TML has the only commercial macadamia nursery in NZ with exclusive rights to the scion wood on location and sole PVR rights for their new dropping varieties. Walter (Vanessa’s son) operates the Nursery, Orchard and plant deliveries from Torere; supported by his sister Raelyn. TML has developed a grower and variety database for all trees sold from their nursery; to assess crop projections for future marketing from a proposed Grower co-operative. TML has the largest macadamia orchard in NZ (3000 tree capacity) of the new dropping varieties with potential for an additional 3000 trees. Rod operates TML’s processing facility in Gisborne; they also utilise an external processing factory to process surplus NIS (nut in shell). TML’s product business is conducted in Gisborne by Vanessa; assisted by daughter Angelina and adult moko’s Sharna and Kayl. TML supplies product locally and nationally; providing organic kernel and added value products to a range of Organic Health Food stores throughout NZ and sales on this website. The variety of products are amazing and favourites are the chocolate and honey coated macadamias. But you have to try the Macadamia karengo crumb mix and a range of Macadamia dukkahs. There’s also an organic roasted Macadamia butter and pesto. TML suffered several setbacks that affected its growth and the growth of the macadamia industry in NZ. The recession caused closure of the nursery from 2008 to 2011 due to lack of sales and cancelled orders. Vanessa utilised that downtime in plant sales to successfully develop macadamia products and markets; obtaining a 3 year SFF grant to establish a macadamia grower co-operative in 2011. Progress on the co-operative establishment stopped in 2012 when Vanessa had Breast cancer. Her whanau rallied around in 2013; Walter relocated to Torere to re-open the nursery and Angelina and her daughters (Sharna & Kayl) took over the product sales in Gisborne until Vanessa’s full recovery in 2014. Poutama first assisted TML in 2001 to assist with the nursery and then again in 2013 with TML’s new logo, labels, website and nursery upgrade. At this time TML also joined Poutama’s Haukai cuisine cluster. Vanessa has also received assistance through TPK’s Maori Business Facilitation Service and NZTE. The latest assistance from NZTE is funding TML’s Capital Raising program to attract investors to participate in expanding macadamia production in NZ to meet the massive demand. NZ produced 45ton kernel and imported 173ton kernel in 2014. 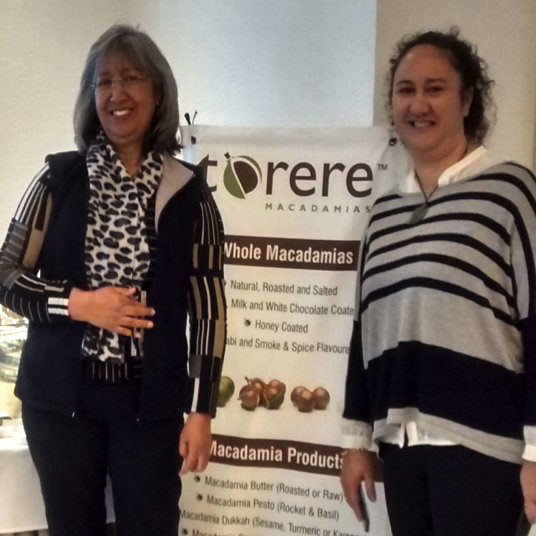 It has been wonderful to see Vanessa’s progress from the first time visiting the nursery back in 2001 to sampling her delicious range of macadamia products and now encouraging more Maori land owners in the East coast to plant macadamias.